This has been drving me insane for practically months now and I have finally found the solution. In Windows 8, you will be working away listening to your favourite music, 'nek minit' your music is so quite you can't hear. You check the Audio Mixer and you find the volume has moved to near Mute. So you think "well that's weird" and move it back to the level you had it at and go back to work. But then it happens again. And again. Well turns out that in Windows 8, they implemented a feature where Windows is "smart" and adjusts the volume when it detects what is call "Communication Activity". 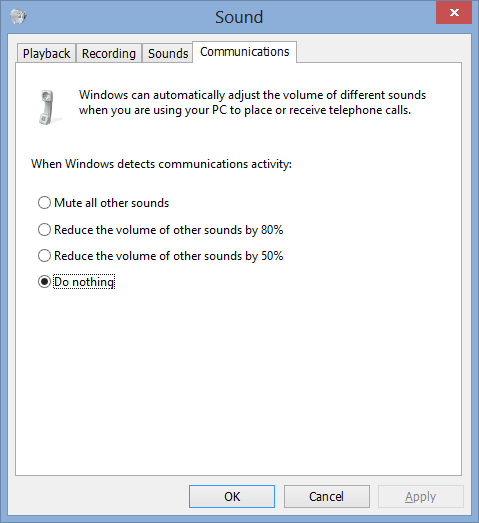 This activity is supposed to be for phone calls or VoIP communications on your computer and reduces the volume by 80%. This will stops the sound from automatically adjusting. If this post was helpful, please leave a comment below and consider making a donation.